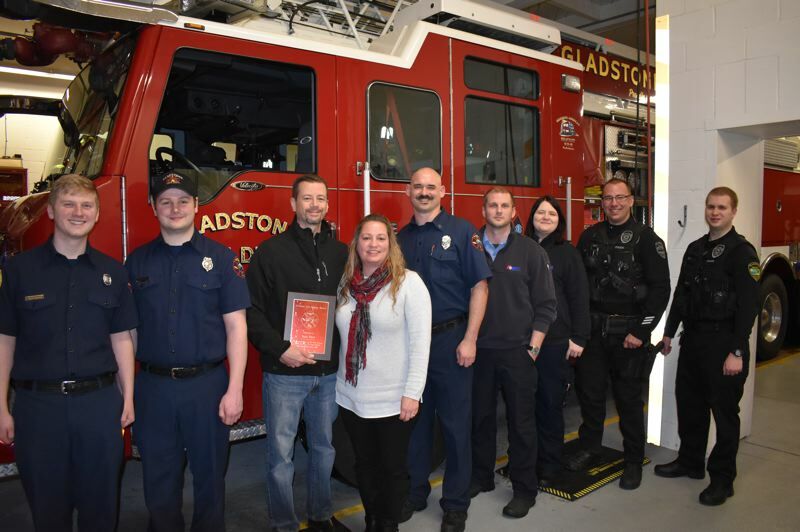 Gladstone resident Sean Flett received a lifesaving award Feb. 12 after he performed CPR on a friend visiting from Washington state. When his friend suddenly became ill on Dec. 25, Flett was awoken by family members in the house, allowing him to start CPR, according to Gladstone Fire Department Capt. Kirk Stempel. Gladstone firefighters, police officers and American Medical Response responded to the cardiac-arrest call to find Flett performing CPR. "First-arriving companies were on scene within four minutes of being dispatched and took over CPR," Stempel said. "Patient was stabilized and transported to a local hospital where he was admitted for three days prior to release." During the award presentation at the Feb. 12 Gladstone City Council meeting, emergency personnel also were recognized for their hard work in response to the 911 call.